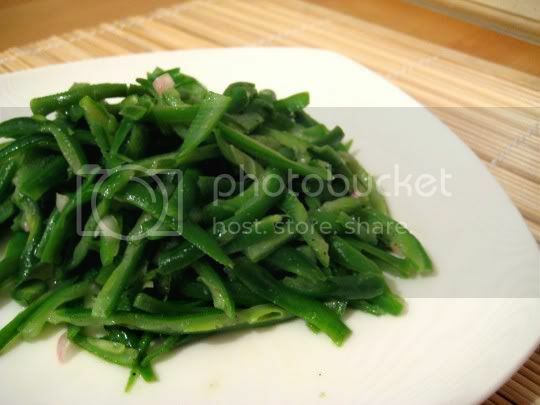 A wonderful side dish for those of you trying to get more greens in your diet, haricots verts (or French cut green beans) are cooked and tossed with a delicious honey-mustard dressing. This dish is extremely easy to make, and really making the dressing is the most difficult part. Although the recipe called for fresh beans, I used a bag of frozen and precut beans which cut down on prep time considerably. I also didn't boil the beans as suggested, but microwaved them for a few minutes until they were steaming hot. The texture of the beans was crunchy, firm, and chewy...perfect. Next, I whisked together the dressing ingredients: salt, pepper, white wine vinegar (the recipe called for champagne vinegar, but I couldn't find that in my standard supermarket), honey, Dijon mustard, shallots, and olive oil. I poured the dressing over the hot beans, tossed them thoroughly, and the dish was ready to go. The dressing is a mixture of sweet, sour, and tangy, and the crunch and pungence of the shallots give a savory note. This would be a wonderful dish for the holidays, as it can easily be doubled or tripled and makes a beautiful presentation. Make again? Definitely. Quick and easy veggies are always a good way to go.